With a distance of only 124 kilometers from Bangkok on an area of ​​180 rai, you will experience the resort designed in the style of a modern bungalow style room. There are 230 rooms and can accommodate about 800 people. You are surrounded by a lush, natural environment surrounded by nature. More than 1,000 companies have been certified as participating in the seminar. Rooms with accessory for attendees are from 30 to 600 people. The resort's restaurant is ready to serve your family. Saraburi is about 108 kilometers away from Bangkok along Phaholyothin Road. Take the Bangkok-Rangsit-Saraburi route to Phaholyothin Road through Wang Noi District of Ayutthaya through Nong Khae District. But to travel to. Muak Lek District, Saraburi Province, the famous tourist attraction of the province, must install the door before entering. 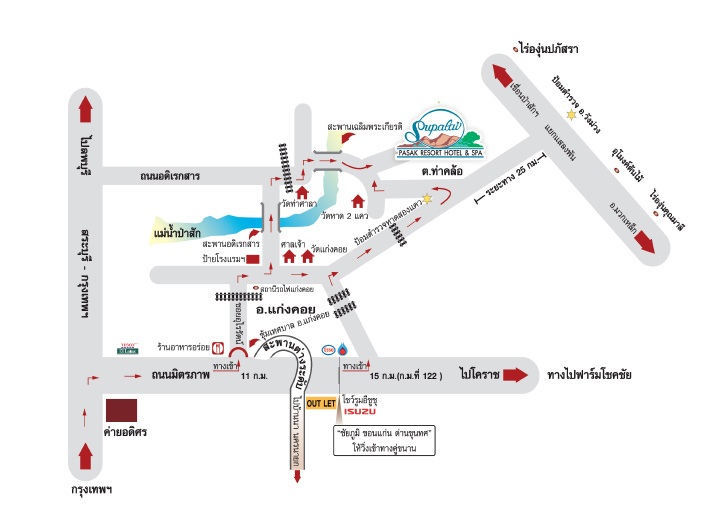 Saraburi City runs into Mittraphap Road, the main road to the Isaan district. Muak Lek is about 39 kilometers from Saraburi town. It will take you to the tourist attractions and resorts spreading along Muak Lek Saraburi.